Despite the full agricultural year that most people faced, there was always time for folk to partake in games, challenges, tests of skill and general larking about. These sorts of things are often festival based, but not exclusively. Gatherings at cattle markets, large social events such as weddings, were also an excuse for the competitive and those of the gambling persuasion to exercise their skills. If there were those who were prepared to take part, then there were always those who were prepared to bet on the outcome. Swimming was a popular sport, both to compete in and to watch, and it seems according to texts that it was considered quite fair to try and drown your opponent. Some of the heroes in the sagas are even said to have competed in swimming competitions whilst wearing their armour. (This is possible. We have tried it with the tunic, trousers and shoes, as well as wearing a mail shirt. The effect is to place your body in a more legs down position in the water. This makes for tiresome swimming, and we found that the Breast stroke was the only really viable way to swim.) Competitions of underwater endurance were also held - perhaps these were all the more dramatic for wearing a mail shirt? Running, often carrying a load (particularly arms and armour), jumping, skiing, skating and horse racing were also popular sports. Tests of physical strength such as weight lifting (using boulders as the weights) were enjoyed. There are boulders in Iceland that have historical significance as having been the stones mentioned in the sagas. Rock climbing and other tests of agility and endurance were also popular (it was said that Olaf Tryggvasson's could walk from one end of his warship outboard by stepping from oar to oar as the ship was rowed.). This particular feat was re-enacted by Kirk Douglas in the film 'The Vikings', where he is seen from a distance walking the oars as they are held parallel to the water by the rowers. This he does with verve, and according to cinematic legend, he did the stun himself. However, I cannot vouch for Tony Curtis having done the same. Another sport was 'skin-pulling', a form of tug-of-war, using an animal skin instead of a rope. To make it more interesting the pull often took place over a fire, which would of course add a certain frisson to the event. Wrestling was widely participated in. The simplest form of this sport was for the wrestlers to take hold of each other's arms or waists as best they could, and using the strength of their arms to throw each other off their feet and onto their backs. The wrestlers often took off their tunics in order to be more free and agile, and to avoid getting their entire wardrobe ruined. Sometimes wrestling took place as a team event, with one member of each team fighting one member of the other team in turn. A more difficult form of wrestling was that of grappling, and attacking each other (sometimes fastened together by a belt at the waist) according to particular rules, and by systematic turnings and gripping movements, seeking to bring each other to the ground. These wrestling matches occasionally ended in fatalities and on lesser occasions, just the odd broken or dislocated limb. Free-men, particularly warriors, would find training with weapons essential. Fighting with swords and shields, throwing spears and stones and shooting with bows and arrows were all popular (the Norwegians organised archery competitions with prizes). All these events helped to hone the skills of all who were expected to fight for their King or Chief, and if he was present, would encourage favour with their leader. Hunting, falconry, fishing, rowing and sailing were all considered suitable pastimes for a freeman or noble, which left the more ignoble sports of grappling with others to the lower classes. The subject of hunting with hounds, hawks and spears is a common one, largely because it was the wealthy who were most likely to see themselves depicted in fabulous books. Another image of men hunting can be found on the web page for the local wood 'Swinwudu'. In this image for the month of September, you can see an organised hunt for Wild Boar, a sport that was not purely for the pot and feasting, although the result never went to waste. Bear-bating, bull-baiting and horse-fighting were also widespread pastimes for those that could afford to indulge in such things. Horse-fighting was particularly popular with the Vikings and there was undoubtedly wagering on the results. Stallions were picked as likely fighters and bred up accordingly, and were probably urged on by the presence of a Mare in heat. These horse fights often, according to the Saga texts developed into fights between the horses' owners, no doubt over disputed results and lost bets. There were also ball games played, such as 'knatteleik', a game played like a violent version of 'kingy-bats', 'sköfuleik' (a rough game played with a 'scraper,' perhaps some form of hockey or hurling), or a game whose rules are unclear called 'soppleik'. The balls for these games were usually of wood, although there are also finds of simple leather balls, which should not be a surprise for anyone from England who has had the unfortunate luck to be struck by a Cricket ball. The rules for these types of games are somewhat vague, but were in the general take the form of a man defending himself with a wooden bat of some description, from the thrown ball. One description elaborates upon this with the 'batter' trying to bat the ball at his opponents. We do not know for certain whether he could be caught out, or any other rules that we recognise today. There were many different board games played, some of which are still played today in one form or another such as 'nine man's morris', 'backgammon' and 'fox and geese'. 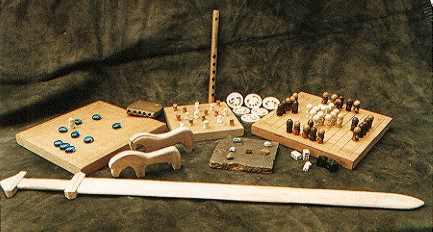 Other board games, called 'Hnaftafl' and the like, which are less well known today were also played. More details about 'Hnaftafl', dice and riddling can be found on or web page 'games'. 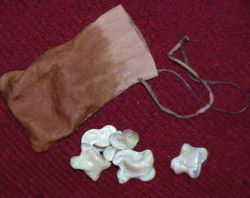 Apart from the huge variety of dice games, there were many games of dextrous skill such as knucklebones. These Knucklebones were used we think in the same fashion as 'Jacks' are today. The rules are fairly simple. One knuckle is balanced on the back of your wrist. This is then flung up in the air, another is snatched off the floor, and with the same hand , the two are caught in the palm. Then two knuckles are placed on the back of the wrist and so on. The knuckles are in fact astragalus's from a pig, stripped of all the meat and fat. One other game that was always thought to have arrived post the Anglo-Saxon and Viking period is Chess. The famous Isle of Lewis Chess set, which is in fact several incomplete chess sets made from Walrus Ivory, is dated to the 12th century AD due to the art style on some of the pieces. This not necessarily in dispute. However, chessmen and sets are now coming to light from Eastern Europe, that are firmly dated to the 10th century AD, that are made from similar materials. With the vast amount of trade and political movement, and the large numbers of Hungarians who came with Edward Atheling in 1057 (the son of Edward Ironside) and stayed in England after his untimely death during the later medieval period, it would seem likely that the game was known in this country. It has yet to be proved in any way with finds though. Pastimes such as whittling wood, carving and decorating bone and antler, etc. would probably have been practiced by many people as an activity to pass the time, even if it was not their profession. it would be interesting to see if there was such a thing as a hobby even then. Perhaps people didn't have spare time as we envisage it, therefore the concept of a hobby would have never entered their minds. Many of the wealthier women undertook embroidery in their spare time, particularly for embroidered wall hangings. They also embroidered 'orphreys' (clerical vestments), for the 'good of their souls'. See our web page on 'embroidery' for further details. Anglo-Saxon needlework was famed throughout Europe, and many embroideries were richly embellished with gold and silver thread, which were then given as ambassadorial gifts for visiting dignitaries. 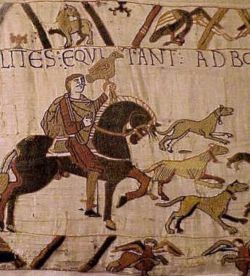 The Bayeux Tapestry was embroidered by English needlewomen, although it is generally thought to be a rather inferior example of Anglo-Saxon needlework despite it's huge size. Other favourite pastimes included music and storytelling. There were many stories of ancient heroes such as the tale of 'Beowulf' or the Norse Sagas. Few of these survive today as they were generally passed on by word of mouth and were very rarely written down. Most of those which were recorded are in the form of an epic poem. Often these poems were composed to record a particular event such as 'The Battle of Maldon'. There were professional storytellers, called 'scops', (see also our web page 'Thorvald the scop' for more details on storytelling), who would travel from village to village telling tales in return for food, lodging and money. Storytelling was not restricted to the professionals, as everybody told stories and the ability to 'spin a good yarn' was highly valued in any person, be he slave or eorl. Singing and music were other prized skills and again there were professional musicians, called 'gleemen', who like the scop, would travel from place to place and play and sing in return for pay. Even the non professionals enjoyed singing and making music, as is shown by the large number of bone whistles found on archaeological digs. Few actual musical instruments have survived from the period although there are quite a lot of manuscript illustrations showing them. These include harps, lyres, whistles, horns, pan-pipes, bones, psalteries and some form of drum. What the music sounded like is more difficult to work out as, on the few occasions it was written down, the system of musical notation called 'numes' was different from that used today. Some tunes are known today which were written down shortly after the Norman conquest and are probably very similar to those played before it. However, asides from that very general description, we are at a loss to say any more due to the lack of any records. Dancing certainly existed, probably generally performed to verse singing, and is likely to have taken the form of circle dances. Various kinds of 'hobby-horse' games, with mummery and miming, were known and many probably had pagan ritual and seasonal significance. However, it was seen as an expression of near wickedness by the church to indulge too much in dancing. Although most children in Anglo-Saxon England and Viking Scandinavia would have spent much of their time working with their parents (and thus learning the skills they would need in later life), they also found time to play. Many of the board and dice games found from this period would have been equally popular amongst children as adults. Adults enjoyed many games and pastimes as we know from pictorial, literary and archaeological sources. Then, as now, children were likely to have copied their elders and so probably participated in many of the sports and physical games popular at this time. It should be remembered that in early Anglo-Saxon England a child was answerable to the law, and thus was considered an adult at the age of 10, which meant that they could become involved in activities that we today would deem too risqué for our own children. In later Saxon times the age was raised to 12. In the winter children would have used bone skates just as the adults did as much for playing as for a means of getting around. 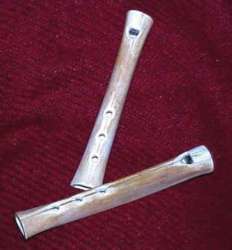 Many children may have learned to play simple musical instruments such as bone or reed whistles or wooden pan-pipes, as well as singing and dancing. Children also probably took part in another popular pastime, challenging each other with riddles. All of the above activities would have also been practised by adults, but children also had their own toys. Carved wooden animals, usually about 10 - 15cm (4-6") long have been found on many sites. Horses were by far the most common animal to be carved in wood, although other animals are also sometimes found. Carved wooden swords are well known, usually very accurate copies in wood of real swords. These are often such good copies that they can be classified according to Petersen's classification for real swords. Many toy wooden ships, carved in various levels of detail have been found, often so accurate different types can be distinguished. In addition to wooden replicas of real items, there are finds of other types of toy. Wooden spinning tops made on the pole-lathe are known from several sites. In at least one case the top had been painted. An unusual item found at Winchester was a bone 'whirrer', and this too may have been a child's toy. Small cast heads and limbs have been found on some sites, but there is debate amongst the experts as to whether these are votive offerings or parts of children's dolls which would have had a textile body. Last updated 17th July, 2009. Article by Ben Levick & Roland Williamson (1995) with amendments by Ms Jay Boydon (2009).